Before the race, all the predictions were of a one-man show. But the 2011 Tour of Flanders threw up surprise after surprise. As the dust thrown up by one of the most extraordinary Classic races of modern times settles, attention switches inexorably, and perhaps prematurely, to this coming weekend’s Paris-Roubaix. The Hell of the North will no doubt be billed as a chance to settle scores, but Sunday’s Tour of Flanders was so gripping, it demands to be savoured and enjoyed a little longer yet. With 40 kilometres to go to the finish, there was a strong and slightly deflating sense of déjà-vu. Fabian Cancellara, the overwhelming favourite to repeat last year’s victory, was pursuing a rapidly-tiring Sylvain Chavanel and looked set to sweep by him before time trialling to the finish. The race had been absorbing to that point, like a promising whodunnit. But Cancellara’s move, following Tom Boonen’s surge at the top of the Leberg and then attacking over the top of the Belgian, was a little like a clumsy reveal after pages of carefully-structured tension. Suddenly we all knew how it was going to turn out. Or so we thought. What followed was a denouement of remarkable complexity. The narrative twisted and turned as a succession of characters stepped forward to stake a claim. The outcome was still a mystery as they turned into the finishing straight in Meerbeke and then Nick Nuyens, who had lurked on the fringes of the drama all afternoon, made his move to take a surprise but thoroughly-deserved victory. Cancellara had been such a clear favourite that much of the pre-race chatter centred on how to stop him. There was talk of Garmin-Cérvelo trying to outnumber him, of Philippe Gilbert trying to beat him at his own game or of a number of rivals simply following him wherever he went. Garmin and Team Sky played the conventional opening move, by putting a rider each in the first serious break of the race. Modern thinking dictates that having a rider up the road just as the final act gets underway can be a huge advantage. For a start it relieves their team-mates of any responsibility to set the pace in the bunch and it offers a stepping-stone for a rider hoping to attack the bunch, bridge across and then push on. Two British riders, Jeremy Hunt for Sky and Roger Hammond for Garmin, were the driving forces in the break and they had Mitchell Docker (Skil-Shimano), Sébastien Turgot (Europcar) and Stefan Van Dijck (Veranda’s Willems) for company. However, the careful tactic of laying some groundwork for the final phase of the race was overruled by an anarchic and aggressive conclusion that refused to settle into any sort of pattern. Just when you thought you had a grip on what was happening, something changed. What made it such a compelling race was that no one gave up on the victory – with the exception, perhaps, of Garmin-Cérvelo, but more of that later. The race really began with the arrival of the Oude Kwaremont, with 85 kilometres remaining. At 2,200 metres it is the longest climb and is the first opportunity to really stretch the bunch and thin down the field. That it is quickly followed by the Paterberg and Koppenberg also makes it the first important strategic battleground. Cancellara was some way back on the Paterberg, as Gilbert set a ferocious pace at the front but it didn’t have the desired effect of breaking the bunch into smaller pieces. At this stage, Cancellara’s Leopard-Trek team-mates had melted away, leaving him isolated. Quick Step tried a faithful tactic that has worked twice for Stijn Devolder. Back in 2008 and 2009, when all eyes were on Tom Boonen, Devolder was the perfect decoy. He attacked, no one chased, and twice he won the race. This time Sylvain Chavanel played that role. Simon Clarke of Astana was with him. Boonen suddenly looked to be in a very strong position. He had a team-mate, Chavanel, up the road and was safely in a group with all the danger men, Gilbert, Cancellara, Thor Hushovd of Garmin and Juan Antonio Flecha (Sky). What was puzzling was that as it regrouped, and with Cancellara lacking support, the others did the work for him. 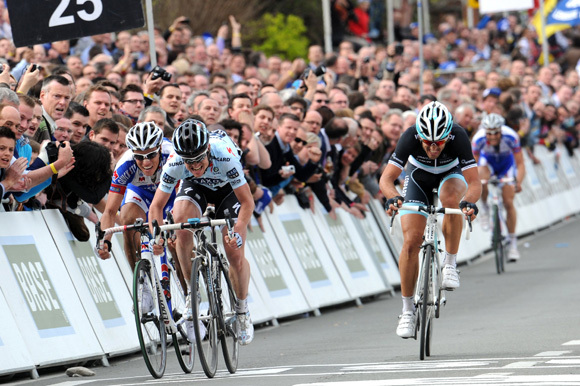 Garmin, Sky, Rabobank and BMC all took turns to keep the gap to Chavanel steady, while Cancellara enjoyed the ride. Once Lars Boom (Rabobank) and Edvald Boasson Hagen (Sky) had joined Chavanel and Clarke at the front, increasing the danger, Cancellara set his only visible team-mate to work. He rode on the front but barely made any impression on the gap. When he completely misjudged a left-hand corner, going straight on instead, he took half a dozen riders onto the verge with him. Whether sheer tiredness or a desperate attempt to get off the front, he was no longer any use. By the time he had got over the Molenberg, the 13th of 18 climbs, Chavanel was on his own in the lead, with the gap over the bunch edging up towards the minute mark. After the long stretch of cobbles at Haaghoek, with the Leberg looming, Gilbert had a rear-wheel puncture. It was possibly the worst time to have a problem and it meant he was out of position when the most important move of the race happened. Boonen, confidence swollen by Chavanel’s heroics and Cancellara’s loneliness, attacked on the Leberg. Ominously, Cancellara reacted immediately. Any hint of frailty was suddenly absent. He knew this was dangerous and he did not hesitate. Filippo Pozzato followed too. Well, what else does Pozzato do? They rode past the group of Boasson Hagen and Boom, fragments of the earlier breakaway, as if they were standing still. Then Cancellara went to the front. And he just pedalled away. When you analyse his style, Cancellara is the embodiment of the aggregation of marginal gains that Team Sky’s Dave Brailsford talks about. His position on the bike, the line he takes round the corners, the lack of any deadspots in his pedalling stroke, all add up to tease out a gap. As they went past Boasson Hagen and Boom, there were a couple of corners, not tight bends, just curves in the road that were enough to force people to think. Through the first Cancellara had a bike length, through the second he had another two bike lengths and once the door was open the draft was chilly. Getting back onto his wheel in those circumstances is very difficult. Boonen couldn’t go with him. Chavanel knew the Swiss rider was getting across to him so he took the opportunity to ease up and grab what little recovery he could. Cancellara caught the Frenchman as they reached the top of the Valkenberg, the 15th climb. And that looked to be that. The inclusion of video cameras in the team cars added an extra dimension to the coverage for television viewers. Although some of the instructions were impossible to make out because of the howl of feedback, it was interesting to gain a little bit of insight into what was going on. As one of the driving forces behind the current move to try to innovate and revolutionise the sport, Jonathan Vaughters of the Garmin-Cérvelo team was one of those to suggest the viewers get a chance to hear what’s said over the race radio. It was, then, perhaps unfortunate for him that one of the most striking orders of the day came from the Garmin team car. With Cancellara seemingly unstoppable, the Garmin riders were told not to chase but to sit in and wait, presumably for a sprint. Given that it looked as if the sprint would be for third place, it was disappointing – the equivalent of watching a white towel being thrown into the middle of the road in surrender. But was it a stupid decision? On the face of it, not at all. With Tyler Farrar likely to be one of the fastest sprinters, and Thor Hushovd also likely to be very fast from a small group, the sensible, pragmatic option was to sit tight and hope for the best. Maybe it would all come back together? But this was not a day for playing the odds. This was not a day for common sense or pragmatism. This was a day for racing with complete abandon and, in contrast to some of their rivals, Garmin looked clinical and risk-averse rather than daring and edgy. As it turned out, things were about to take an incredible turn, and it was all thanks to BMC Racing who decided that the only way to win was to sacrifice everyone except Alessandro Ballan and George Hincapie. With so many riders – almost the whole team – still in the front group, they massed at the front and wound the pace up. It was a thrilling sight. A team that had the resources to do something about the situation and decided that they may as well try. And the gap came down. Cancellara, who was towing Chavanel towards the Muur, was beginning to tire. Whether he was hungry or thirsty (at one point he took a bottle from neutral service) he began to cramp on the Muur. This was not the same irrepressible force that had made Tom Boonen look like a leaden-footed commuter on a city bike a year ago. Perhaps Cancellara was a victim of hubris – did he believe in the omnipotence of his own strength as much as we all had in the weeks leading up to the race? Yet as Cancellara heard the breath of his pursuers his thoughts were not of surrender. In fact, he tried to go again on the Muur, scene of one of his finest moments last year, although the power was not there. 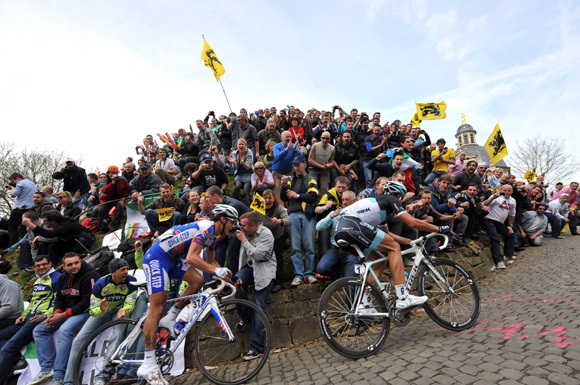 The front five over the Muur were Cancellara, Gilbert, Bjorn Leukemans, Ballan and Chavanel. BMC’s heroics had paid off and their man was in with a shout. Behind was another group, packed with potential winners. Boonen, Flecha, perhaps even Geraint Thomas. But there were no Garmin riders. They’d played such a cautious game that when the big move happened, they missed it. Now there was just the Bosberg and the run-in to go. How easy it is to say. Just the Bosberg. A long, steady drag that kicks up sharply as you enter the woods and delivers the final 400 metres of cobbles of the race. Gilbert may rue his decision to attack as soon as they reached the cobbles. In a huge gear he surged away and then stalled. Ballan tried to go with him but for Gilbert this was it, do or die. Behind them, Cancellara was dropped, his grip on the race finally loosened. Perhaps it would have been smarter for Gilbert to wait until halfway up and attack with slightly less force in order to pull a group clear. All he needed to do here was to increase his chances by thinning the group. Hoping to ride alone to the finish was asking for a superhuman effort. Ballan couldn’t get across. Gilbert’s face was contorted in pain, perhaps an indication that even he knew this was doomed to fail. The recovery of Cancellara, who got back up to the group of 12 and then managed to join in the effort to recapture Gilbert was astonishing. But that was nothing compared to what was to come. All the riders deserve credit at the end. They all did something to try to win. Sebastian Langeveld of Rabobank tried one of the more notable attacks. Sky tried the old-fashioned one-two with Flecha and Thomas. But it was Cancellara who sparked what proved to be the decisive move. Incredibly, with under four kilometres to go he attacked. Just as incredible was that the Quick Step rider that went with him was Chavanel, rather than Boonen. Perhaps Boonen thought it was inevitable that Cancellara would tire and he’d mop up the sprint? Nick Nuyens, the quiet man of the race, was almost unnoticed as he went across with them. The lead was never more than extremely tenuous but it was enough. They rounded the final corner and Cancellara gave it one last shot, opening the sprint up early. Chavanel was completely spent. Nuyens tired but having done a fraction of the work of the other two, was suddenly the favourite. Behind them Boonen did the only thing available to him and opened up his sprint with 700 metres to go. There was one similarity with last year. Saxo Bank and Bjarne Riis were celebrating only this time it was Nuyens, not Cancellara, on the top step of the podium. Nuyens was the winner but to focus purely on the result sheet does not begin to tell the story. In fact, any account could place greater emphasis on one of the small but significant details over another. The fact is that a million decisions were taken during the course of the race and thousands of external factors played a role. This edition of the Tour of Flanders brought home to the viewer that each of those individual factors and decisions plays a role in the outcome of the race. Change a handful of them and the outcome would have been different. “Too strong. Your boy is too strong,” we heard the Quick Step directeur sportif Wilfried Peeters tell his Leopard Trek counterpart, referring to Cancellara. But when someone else crosses the line first, it doesn’t actually matter who the strongest rider was. And that is the beauty of cycling’s monuments.